OTTAWA, Ontario, Canada, October 24, 2012 (ENS) – To attract Chinese investment for development of the Alberta oil sands and other natural resources, Prime Minister Stephen Harper is pushing through a treaty that gives away Canadian legislative and judicial sovereignty with no public debate, warns a Canadian international investment law expert and law professor. The deal could be ratified in Parliament as early as October 31, says Professor Gus Van Harten of York University’s Osgoode Hall Law School, one of very few voices raised in warning. 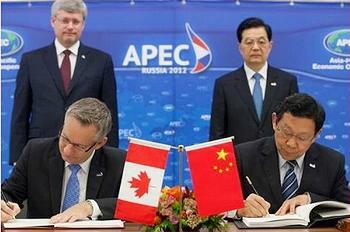 Prime Minister Harper and Chinese President Hu Jintao oversaw the signing of the treaty in Vladivostok in September on the margins of the Asia-Pacific Economic Cooperation meeting. 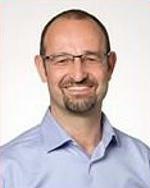 Although the Canadian government has been “dodging the question of when they’re going to finalize it,” Van Harten says the Canada-China Foreign Investment Promotion and Protection Act could take effect at the end of November, 30 days after ratification, if there is no public outcry or constitutional challenge from any of the provinces or First Nations. If the treaty is ratified, Van Harten fears Canadian and provincial governments and First Nations would lose their power to regulate natural resource extraction and the environmental damages that may result from any project in which a Chinese investor is involved. But Van Harten has not received a reply from the federal officials. He has sent letters to provincial premiers, two of whom had no idea this was happening, although the deal could restrict provincial powers, said Van Harten, who declined to identify the two ignorant provinces. 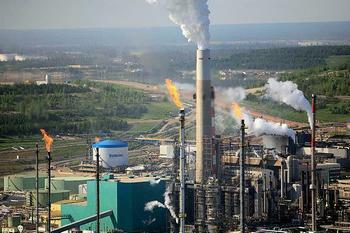 In an interview with ENS, Van Harten detailed what could happen to the Canadian environment if this treaty is ratified. He says this treaty is “unique” because there would be much more investment coming into Canada than under any other Foreign Investment Promotion and Protection Act, or FIPA, as these treaties are commonly called. Van Harten says any province or First Nation could delay the ratification to allow time for public debate by filing a lawsuit in any Superior Court in the country before Parliament ratifies the treaty. “Provincial governments are the best hope to pick up the phone and demand delay. They can seek an injunction to delay this,” Van Harten said. “Under the Canadian constitution, the federal government is incapable of unilaterally implementing international treaty obligations in areas that fall within provincial jurisdiction. Nor is it acceptable for the federal government to use its treaty-making powers to do an end run around the federal-provincial division of powers or in a way that diminishes Canadian federalism and democracy,” he wrote to Premier Clark. “Some of the more important to British Columbians include: the management and conservation of natural resources; health care, education, and other social services; the regulation of property and civil rights in the province; and municipal institutions and governments,” he wrote. How is it that the federal government can expose provincial measures to binding international arbitration without the province’s consent? Who will pay if a provincial measure is found to violate the federal government’s treaty obligations? If the provincial government maintains an inconsistent measure, might the federal government be required to pay ongoing damages? Setting aside the jurisdictional issues, is it fiscally responsible for the federal government to negotiate an agreement that exposes it to open-ended liability for provincial government measures? And, faced with an adverse ruling, what steps might the federal government take to try to force provinces or municipalities to remove offending measures? Some Canadians are beginning to become alarmed. Greg Spendjian, representing the nonprofit Citizens for Cross-Party Cooperation, today expressed “extreme concern” in a letter to the editor of the “Vancouver Sun” newspaper.